The Rolex 6238 Chronograph is gaining in popularity thanks to its elegant and balanced design enabling it to be considered as a sports chronograph when worn with an Oyster bracelet or a more casual chic model when toned down with a leather strap. 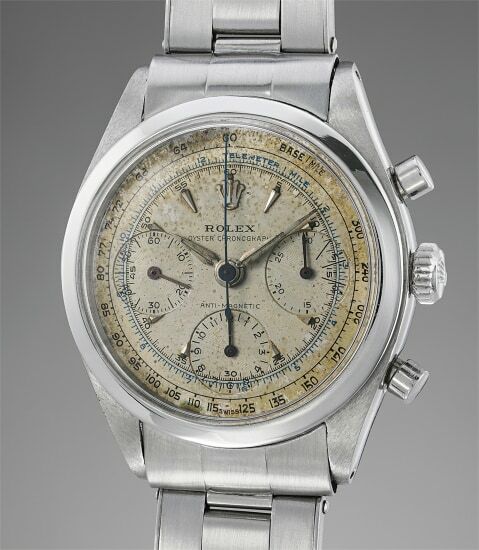 Produced for only seven short years from 1960 to 1967, the Rolex reference 6238 also called “Pre-Daytona” came either in a stainless steel or yellow gold case with a variety of dials silver, dark grey, black and rarer versions with blue or blue and red multiscale. The present reference 6238 comes with a dial with black and blue scales found habitually in the reference 6234, the immediate predecessor of the reference 6238. As the present watch is one of the very early reference 6238, created at a time when the reference 6234 was being phased out it is thus not unusual to see this combination. Rolex continued using dials of discontinued models in succeeding references showing the overlap and continuity of their designs.